The package containing these bibs from OnesiesDownUnder arrived by international courier (DHL) and the customs form stated clothing and toys which made the delivery very discreet. The sender was listed as "Andrew", and there was no mention at all about OnesiesDownUnder. This gives you peace of mind that your package is discreet as you obviously don't want overt branding on ABDL packages in the post. Deliveries from OnesiesDownUnder are always discreet and well packaged. You may have to pay importation duties depending on the value of your order but I have found that these are sometimes hit and miss but it is worth bearing in mind. 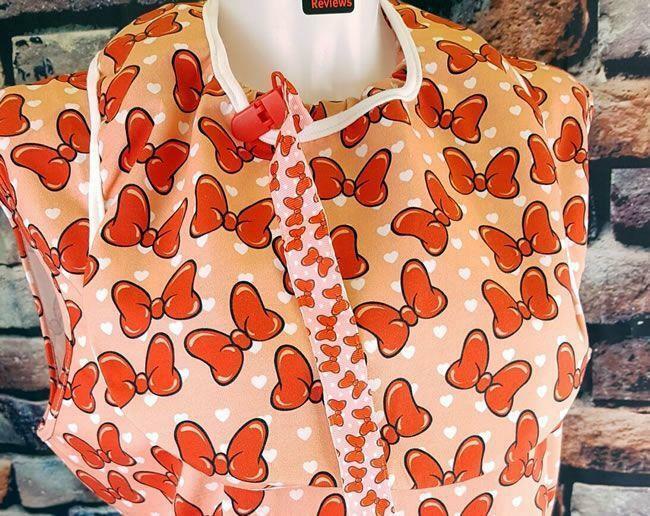 We have reviewed lots of items of clothing now, and I have a bit of an eye for quality, and as soon as I opened the package and laid eyes on these bibs, I knew that once again OnesiesDownUnder has come up trumps. The quality is excellent, and I will tell you why I can say that later in this review. So, why am I reviewing bibs? Well, bibs are often used in DDLG and ABDL play, and we use them for Little Rae, they are incredibly useful but often forgotten pieces of equipment. Bibs are designed to fasten around a Little's neck, and their job is to catch fluids, preventing them from staining or just making a Little's clothing wet. We use them when Little Rae is using a sippy cup or bottle, when sucking on a pacifier they can also be of use if your little is prone to lapses of attention or he/she is a drooler. They are invaluable though when including a gag in your play sessions. A gag forces the jaw open and somewhat interferes with a Little's ability to swallow. This makes drooling inevitable, and you would be surprised at how much a Little can drool when a bright and shiny gag is in their mouth. A bib catches all of this drool preventing clothing from becoming saturated in it and let's face it a bib can make a cute Little even cuter. Some Littles really respond well to wearing a bib while others don't like wearing them as much. It is therefore up to the Dominant, whether they be a Daddy or Mommy to decide if their Little will wear one. These bibs from OnesiesDownUnder are fantastic quality, being made from the finest materials. They are double sided with the outer side being absorbent featuring bright patterns while the underside is made from a waterproof material. The effect of these two layers of material is a bright bib that is very absorbent but that will prevent any fluids from leaking or soaking into the clothing underneath. The designs are very bright, and even after about ten washes now there is no sign of fading, and they are both as good as new which is a testament to the quality of their manufacture. 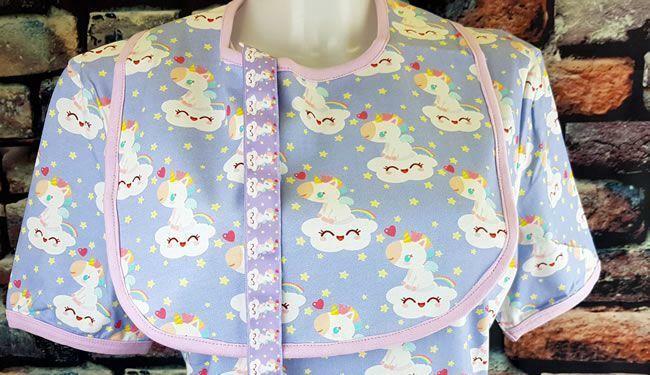 The two designs are lovely with the Sweethearts featuring lots of bows and love hearts and the Dreamy design feature unicorns atop of sleepy clouds, and it looks fantastic. Each is edged with tape, and this is stitched very neatly securing them tightly to the bib and giving them a pleasingly smooth and tidy edge. The ends of the neck pieces secure together behind the neck with a very wide strip of white velcro. This holds the bib in place very securely, and it also means that these bibs will fit any neck size very snuggly indeed. In fact they will fit neck sizes upto 20"/50cm. With the bibs measuring in at 14.8"/35cm x 9.5"24cm (not including neck tabs). These bibs are very flexible and hang from the neck nicely. They work a treat, especially when exploring gags in our play sessions where Little Rae produces a lot of drool that both of these bibs cope with very well. They are also useful when your little is eating for the same reasons as when they are drinking (or drooling). I would rather my little make a mess of a bib than her entire outfit, and so a bib is a sacrificial layer over your little's clothes that can take the mess and punishment without ruining their outfit underneath. We have used these bibs lots and lots of times now, and each has been washed in the region of ten times, and neither shows any sign of deterioration. They are washing machine safe but hang them vertically while drying before ironing them flat. "I have had lots of bibs in the past from e-bay, and they never last with the plastic backing breaking up or the design fading. These ones are as good as new. They work really well when I dribble and drool as well as when I am using a diddy or sippy cup. I like the fact that I can fit them and remove them quickly, so I only have to wear them when I need to. OnesiesDownUnder produces the best equipment I have tried, and I love these bibs." I just love the fact that Little Rae can dribble and drool as much as she wants without me having to change her outfit, for this reason alone a bib is an essential part of little play in my eyes. 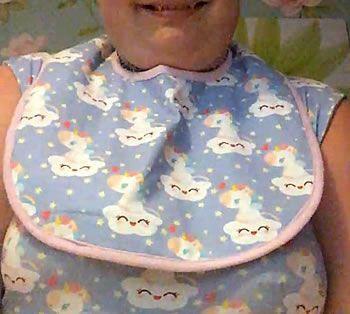 At the moment you can only buy the Sweethearts Bib on the OnesiesDownUnder website, and it is currently on sale at half price which makes it a fantastic bargain for any Little out there. If you like to use a bib or even if you have never done so, but having read this you now know why they make so much sense you can grab a real bargain. I love the products from OnesiesDownUnder, everything that I have ever seen from them has been fantastic quality, and it will last a very long time. Check out my review of their Pacifiers, Pacifier Clips and Onesies to see what I mean. These Bibs are both hard wearing and cute, they do their job admirably and save your Little's outfit from juice, drool and other materials. Every Little should have one. We have used cheap ones from e-bay in the past, but they just don't last, not having the quality materials and high levels of quality control that OnesiesDownUnder products have. Having reviewed a few of their products now, I am delighted by them and have no hesitation in giving them a strong recommendation to anyone looking for fantastic looking products that will stand the test of time. I was sent these Bibs by OnesiesDownUnder for free in exchange for a fair and honest review of them and I would like to thank them for giving me the opportunity to review them. Grab one oof these amazing printed Bibs from OnesiesDownUnder for just $7.50 AUD (Usually $14.95 AUD ) which equates to £3.97 which is fantastic value for money. Check out the fantastic designs of their Onesies, Twosies and Bibs as well. I have no problem in giving OnesiesDownUnder a huge thumbs up and a strong recommendation for anyone in the DDLG or ABDL scenes. Little Rae is delighted with them and that means I love them too.